They produce a lot of biomass, at least 3 tons above-ground dry matter per acre. they die down naturally in time to plant summer vegetables. Their residues are sufficient to provide effective weed control in the subsequent vegetable crop. They provide habitat for natural enemies of vegetable crop pests. They have favorable (or at least neutral) effect on levels of available soil N, P and K.
They do not suppress the vegetable through chemical (allelopathic) or microbial effects. They do not present serious weed, pest, disease or other management problems. Often, a combination of a grass and a legume is used, since this enhances biomass production and therefore mulch thickness, weed suppression and organic matter inputs. The combination also offers a balanced carbon to nitrogen (C:N) ratio, which gives a gradual release of plant available N, in contrast to the N-immobilization (tie-up) by an all-grass cover, or the rapid N release and potential leaching losses from an all-legume cover. The higher diversity of a two-species cover crop can also enhance allelopathy (suppression of weeds by natural chemical substances from the mulch), diversity of beneficial soil microbes, and nutrient effects. For instance, legumes tend to enhance availability of phosphorus (P), while grasses, especially rye, enhance availability of potassium (K). The most widely-known and extensively researched organic no-till systems are those based on hardy winter annual cover crops, mostly combinations of cereal grain rye (or winter rye), hairy vetch, crimson clover and Austrian winter peas. These crops are planted in early fall, and mowed or rolled after they flower the following spring, usually in May. Summer vegetables like squash, cucumber, pepper, tomato, eggplant, okra, sweet corn, beans, or (in cooler regions) mid-season brassicas, are then transplanted or direct-seeded no-till into the cover crop mulch. In recent years, growers and researchers have begun experimenting with a much wider range of annual cover crop species for no-till vegetables planted at other seasons. Other cool-season annuals like oats and fava beans can be planted in early spring, then killed in mid summer for late plantings of cucumber, bean or summer squash. Summer annual (frost-tender) cover crops like millets, cowpeas or soybeans can be planted after the spring frost date, then knocked down at the end of summer to plant fall brassicas or other fall crops. Finally, cover crops that are not winter-hardy in a given location can be planted in mid to late summer and allowed to winterkill, forming a mulch for no-till spring vegetables. One of the basic tenets of sustainable agriculture is that greater diversity yields greater agro-ecosystem stability, more beneficial organisms, fewer pests and diseases, more sustained crop yields, and more opportunities for farmer innovation. We feel that this is true also of cover crops, and one of the objectives of ongoing research is to develop a larger cover crop “toolbox” from which growers can select cover crops most suited to their regions and production systems. 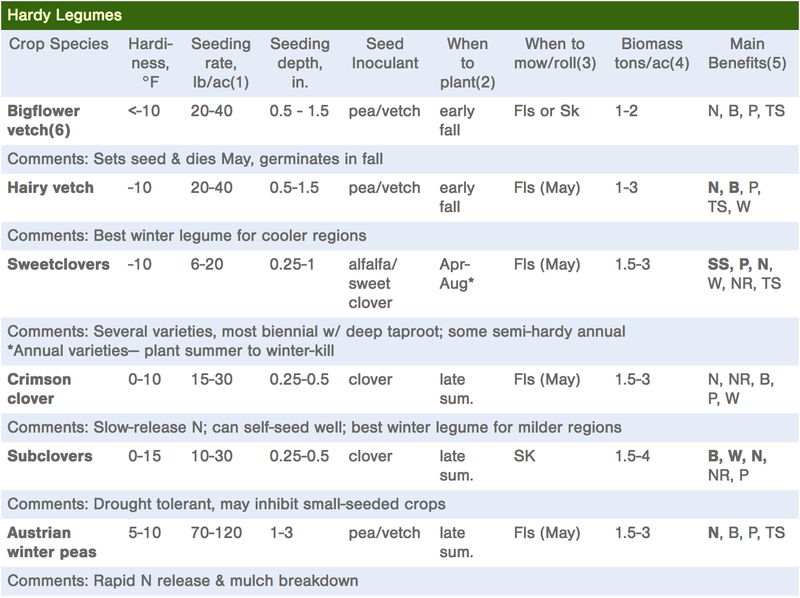 The following table gives some basic information on a number of cover crops, some tried-and-true, and some less-known experimental species. 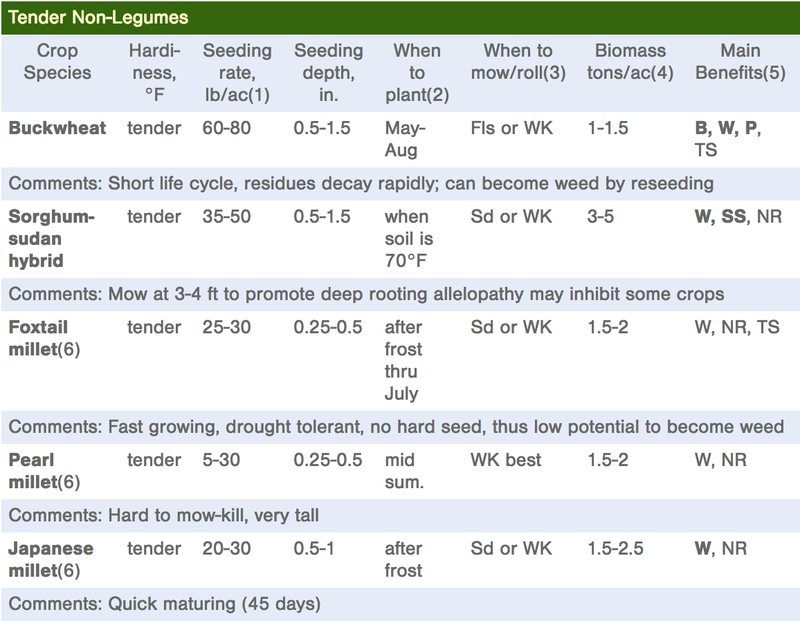 The table is organized into legumes and non-legumes, listed in order of cold-hardiness. 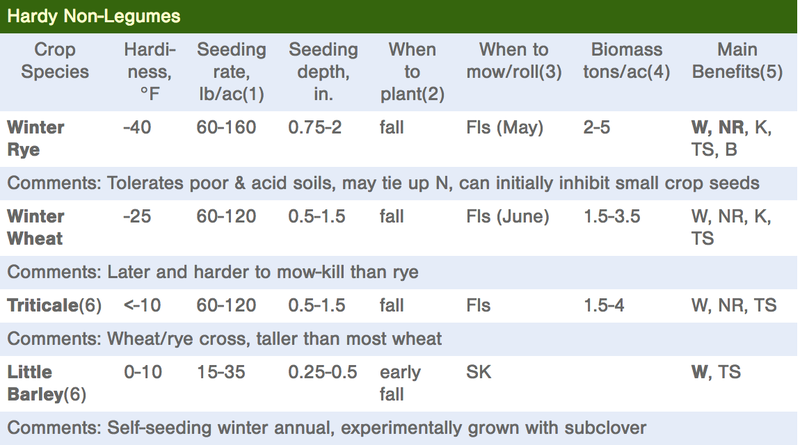 The table is intended not as a cover crop prescription for organic no-till vegetables, but as an information resource for farmers and other experimenters to use in selecting cover crop combinations for their specific vegetable crop rotations and cropping systems. Click any of the tables below to enlarge. 3. 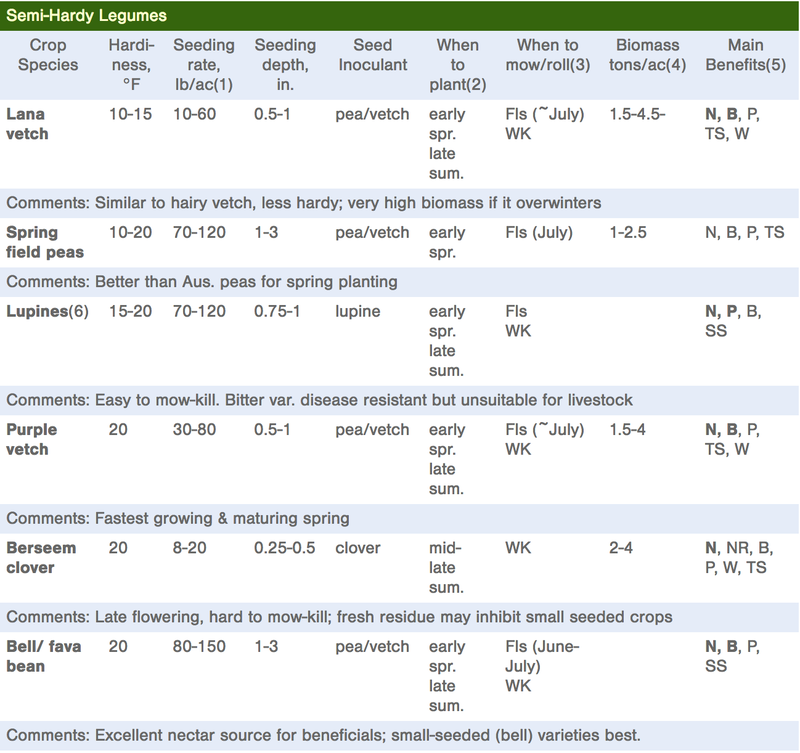 Fls = mow/roll at full bloom (legumes) or pollen-shed (grasses); Sd. = mow/roll when seed partially developed (green or milk stage); WK = winterkill; SK = sets seeds and dies down in late spring; seeds germinate in late summer or early fall. No mowing needed for WK or SK. 4. Estimated aboveground biomass for cover crop grown until full bloom, immature seed stage, or winterkill in Zones 6b-8b of southeastern US, including VA, NC, SC, KY, TN, GA, AL. 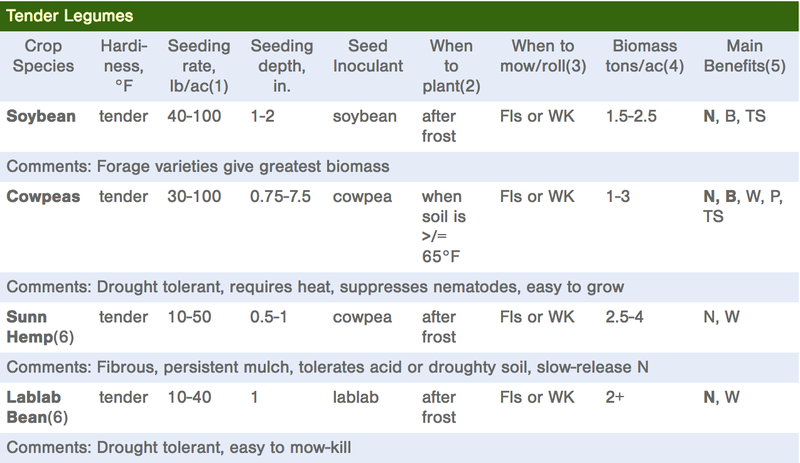 Total biomass including roots + exudates is 50-100% more. 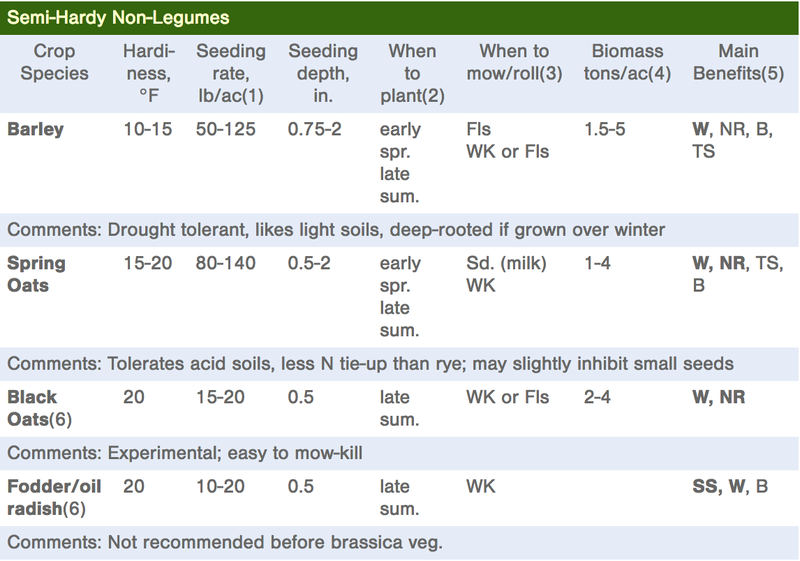 Biomass for grass + legume covers may exceed either one grown alone. Managing Cover Crops Profitably, 2nd Edition, Sustainable Agricultural Network, Handbook Series No. 3, National Agricultural Library, Beltsville, MD 20705-2351. 212 pp. Peaceful Valley Farm Supply, P.O. Box 2209, Grass Valley, CA 95945; tel 888-784-1722; www.growingorganic.com. Products and Seed Catalog. Overview of Cover Crops and Green Manures, Fundamentals of Sustainable Agriculture series bulletin, 16 pp. Available through Appropriate Technology Transfer for Rural Areas web site or by phone order. ATTRA, P.O. Box 3657, Fayetteville, AR 72702; tel. 1-800-346-9140; www.attra.ncat.org. Pursuing Conservation Tillage Systems for Organic Crop Production, Organic Matters series bulletin, 28 pp. Available through ATTRA web site or phone order. Summer Cover Crops, by N.G. Creamer and K.R. Baldwin, North Carolina Cooperative Extension Service, Horticulture Information Leaflet 37, 1999, 8 pp. Professor Ron Morse, Department of Horticulture, Virginia Tech, Blacksburg, VA 24061. Tel. 540-231-6724; e-mail morser@vt.edu. Dr. Keith Baldwin, P.O. Box 21928, North Carolina A&T State University, Greensboro, NC 27420. Tel. 336-334-7957; e-mail kbaldwin@ncat.edu. Dr. Mark Schonbeck, 439 Valley Drive NW, Floyd, VA 24091. Tel. 540-745-4130; e-mail mark@abundantdawn.org.